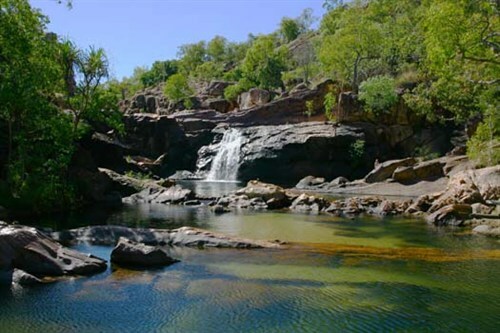 Kakadu National Park is one of only four Australian sites World Heritage listed for both cultural and natural reasons. 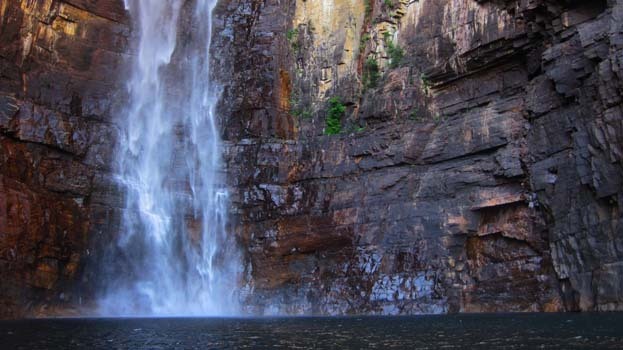 Such worldwide recognition gives Kakadu a very high profile, resulting in nearly 200,000 people visiting each year. Determined not to be put off by the crowds, writer Amanda Burton headed in to tick off another ‘must see’ from her travel list. We approached Kakadu from the south, fuelling up at the Wirnwirnmila Mary River Roadhouse, the last fuel until Cooinda, which is well into the park. With much anticipation we headed over to the Goymarr Interpretive Centre next door to pay the $25 per person Kakadu NP pass and collect our key. 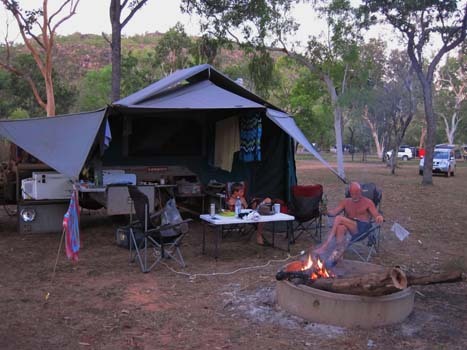 We had booked many months ago in order to camp at Koolpin Gorge (Jarrangbarnmi). 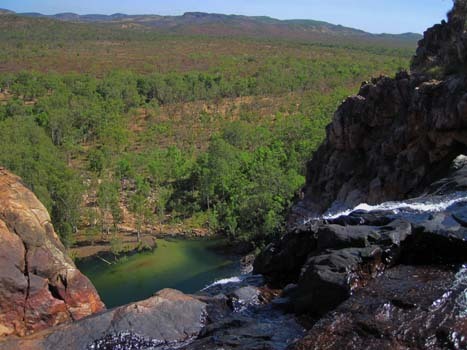 Access to this gorge is high clearance 4WD only, permit allocated, key-locked entry and there is a limit of 40 people who are allowed to use the area at any one time. 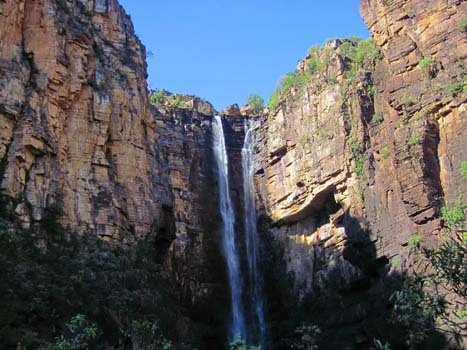 Visit a Kakadu National Park travel guide. 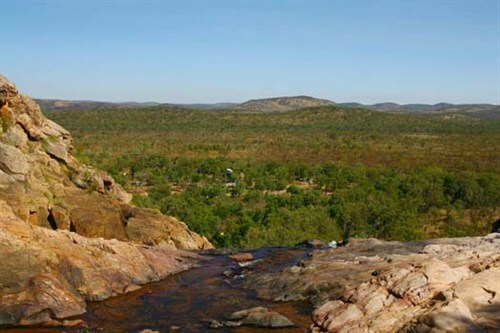 Within Kakadu National Park, areas stay closed until the wet season waters subside to a point that the crocs are less likely to be moving around and the graders can get in and repair the roads from flood damage. The rangers then have to see if any crocs have moved in during the wet. They do this through visual inspections as well as placing baited traps and foam buoys in the water. Crocs are curious creatures and will have a chew on a buoy, thus giving their presence away. 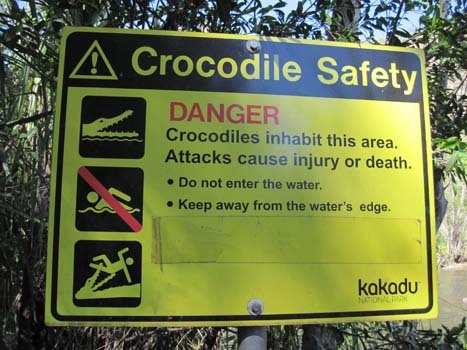 If a croc is detected, it can then be dealt with in a number of ways. If it is a smaller one, it will be trapped and moved on. 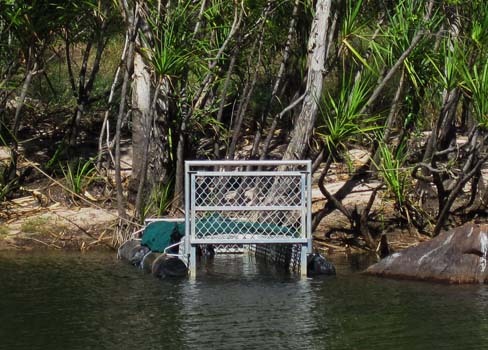 This has variable success as crocs are quite territorial and there are stories of them travelling hundreds of miles to return to a favourite spot. Back at Gunlom, where the campground was spacious and refreshingly, we found ourselves a space beside a fire ring to set up the camper and wandered down to check out Gunlom Falls, which were lovely. Even though the falls were classed as ‘open’, one ranger told us he certainly wouldn't be swimming in the bottom pool just yet, so we restrained ourselves and opted for a solar heated shower in the mosquito infested ablution block instead. The next morning we negotiated the steep climb to the top of the falls to find a series of beautiful rock pools, steeped waterfalls and a delightful view across the plains and campground far below. We spent hours swimming in our very own natural infinity pool — it would have to be one of the most spectacular swimming spots I’ve ever experienced. The trick was to endure the crowds from the 'adventure' tour buses that would descend to clog the pools periodically but tended not to hang around too long, soon returning you to peace and tranquillity. View more information on Gunlom Falls. The track into Garnamarr Campsite at Jim Jim Falls is marked 4WD only, but we found it to be a dream road; smooth, wide and no corrugations. We set up the camper in a marked bay (be warned that not many of the bays are suitable for camper trailers) and took off to see the falls. 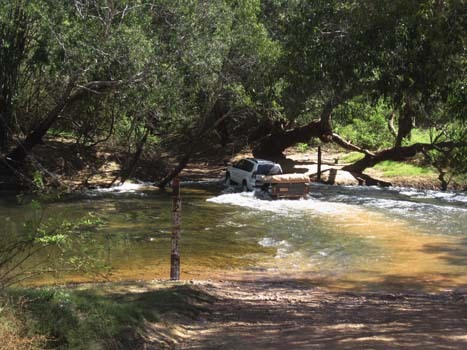 It is 10km from the campground to the falls carpark and it was here we realised why they say it's 4WD access only. It’s a great little track, twisting with creek crossings galore. There were lots of ‘speed bumps’ to disrupt the water flow in the wet and preserve the road, so a high clearance vehicle was essential. We followed a LandCruiser in and his departure angle was challenged on a number of occasions. The mound between the wheel ruts was often quite high, and there was plenty of long grass to decorate the radiator. The walk into Jim Jim Falls started easily enough, through to a pool with a croc trap still in it (note to self, no swimming here). Then it started to get more challenging as we negotiated up and over and then through a bolder field. The 1km estimate must have been as the crow flies because it seemed much longer, and despite the poorly marked trail we finally made it to the end. View more information on Jim Jim Falls.